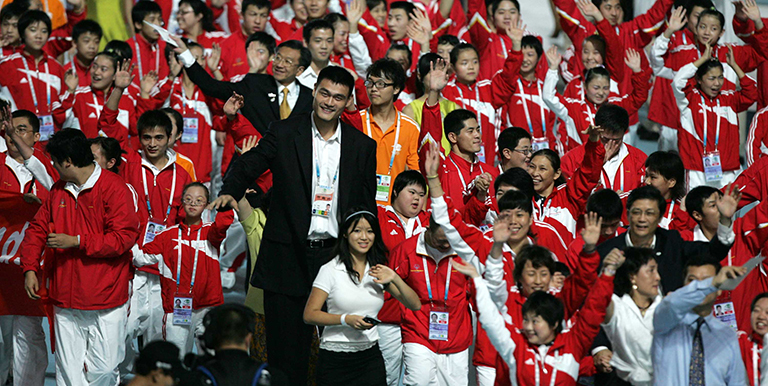 Retired basketball player Yao Ming supports a more inclusive world as a Special Olympics Global Ambassador and board member. Photo Credit: Special Olympics. Inclusive cities acknowledge people with intellectual disabilities and work with them to address their special needs. Cities need to include all people, including those with intellectual disabilities. In an inclusive city, everyone is valued; has access to basic infrastructure, services, and opportunities; and can freely exercise his or her rights. In Asia and the rest of the world, people living in urban areas will nearly double by 2050, further creating challenges for marginalized groups. Nearly 35% of working-age people with disabilities are below the poverty line and face unemployment rates twice that of the general population. Dialogue and action to achieve greater inclusion of those with disabilities in cities have focused mainly on improving physical accessibility. Accessibility for people with intellectual disabilities, an estimated 3% of the total population, remains a challenge. What are the obstacles to creating inclusive cities for people with intellectual disabilities? Low expectations and stigma, based on society’s perceptions of intellectual disabilities. A focus on physical disability oftentimes excludes the needs of people with intellectual disabilities or only partially considers their needs. Poor data gathering means people with disabilities and their needs are often invisible to policy and decision makers. Lack of people with intellectual disabilities in leadership and decision-making positions. Insufficient programs, facilities, services, and staff trained to support their needs. People with intellectual disabilities are underused or overlooked in the workplace. What are the benefits of creating inclusive cities? Including people with disabilities can help economic growth. Excluding people with disabilities comes at a cost of 3%-7% of gross domestic product in low- and middle-income countries. People with intellectual disabilities have higher retention rates than people without disabilities, and they tend to stay in their jobs for 3 years or more. An inclusive learning environment, where students with and without disabilities attend classes together, helps promote social inclusion. More than half of the people who have had personal contact with someone with intellectual disabilities are more accepting of them. Access to appropriate health services improves well-being and lowers costs by reducing hospital admissions and shortening the length of stay. Healthier people are better able to take care of themselves, reducing pressure on their caregivers. Inclusive sports (where people with and without disabilities play and compete together) increases awareness and builds relationships. This also improves fitness and reduces non-communicable diseases in participants. Who has committed to ensuring people with intellectual disabilities are included? The United Nation’s New Urban Agenda mandates that cities serve the needs of their entire population with policies and legislation, information technology, services, employment, infrastructure, and governance that are accessible to all. Most countries in the world have agreed to the principle of human equality and have recognized this right for people with disabilities and have committed to the UN Convention on the Rights of Persons with Disabilities (CRPD). Countries have agreed to achieve the UN's Sustainable Development Goals by 2030. The UN, aid agencies, regional bodies, private business, academic institutions, and nongovernmental organizations, such as Special Olympics, all have roles to play in helping governments meet their obligations and commitments. Special Olympics’ programming in sports, education, and health provides models of how cities can include people with intellectual disabilities. Special Olympics Programs in the Dominican Republic, Panama, the United Arab Emirates, and the United States are currently engaging city governments and other actors to partner and support inclusive programming in urban and semi-urban environments. UNESCO has developed an assessment tool for helping cities and their citizens measure progress toward the fulfilment of inclusion commitments. It has also ensured that the Global Active Cities Initiative, which encourages cities and organizations to improve peoples’ lives through physical activity and sports, includes all disabilities. The Asian Development Bank’s (ADB) partnership with the Cities Development Initiative for Asia ensures that inclusiveness and sustainability are incorporated at the design stage in city planning. Yogyakarta in Indonesia, Yangzhou in the People’s Republic of China, and Kathmandu in Nepal are among the cities in Asia that are working to become more inclusive. ADB and Special Olympics are also exploring ways to build the social infrastructure of cities and make them more inclusive throughout Asia. They are looking for solutions to reduce inequalities via increased awareness of the needs and capabilities of people with intellectual disabilities, improving education, and achieving better health for all. How can ADB and Special Olympics help create inclusive cities in Asia? Host a regional symposium with key Asian cities that are currently promoting inclusive practices, policies, and programming, and share best practices. Offer inclusive sports, especially in public and green spaces, to build the social infrastructure of a city. Offer and promote inclusive school environments where children with disabilities are enrolled in activities alongside their peers without disabilities. Increase visibility and engagement of those with intellectual disabilities in decision-making structures by involving them at the outset in all city planning efforts. Improve access to quality and appropriate health care for people with disabilities and educate health-care professionals on how to interact with them and treat them. For any ADB-supported project that builds the physical or information technology infrastructure in a city, Special Olympics Programs can ensure that the city and project staff consult people with disabilities on how their needs can be met. The collaboration between Special Olympics and ADB can create a legacy of inclusion in cities throughout Asia. United Nations Department of Economic and Social Affairs. 2014. World Urbanization Prospects Report 2014. New York. United States Senate Committee on Health, Education, Labor and Pensions. 2014. HELP Committee Disability and Poverty Report 2014. Washington D.C.
 United Nations International Labor Organization. 2010. The Price of Exclusion: The Economic Consequences of Excluding People with Disabilities from the World of Work 2010. Center for Social Development and Education at the University of Massachusetts Boston, administered by Gallup and commissioned by Special Olympics. 2014. The National Snapshot of Adults with Intellectual Disabilities in the Labor Force 2014. Washington D.C.
 Center for Social Development and Education at the University of Massachusetts Boston, and commissioned by Special Olympics. 2003. The Multinational Study of Attitudes toward Individuals with Intellectual Disabilities 2003. Washington D.C.
World Health Organization and The World Bank. 2011. World Report on Disability 2011. Malta. Annemarie Hill cultivates and leverages partnerships with international nongovernmental organizations, aid agencies, governments and development stakeholders to promote the inclusion of individuals with intellectual disabilities. Christy Weir helps transform the way the international development community engages people with intellectual disabilities, and how they can expand social protection coverage, improve inclusive policies, and commit to resources and services that benefit those with disabilities.